Do you know those bloggers that seem to pop up everywhere? Those people that you seem to find again and again until you can’t do anything else but bookmark their blog or subscribe to their mailing list? These people have great online webs! 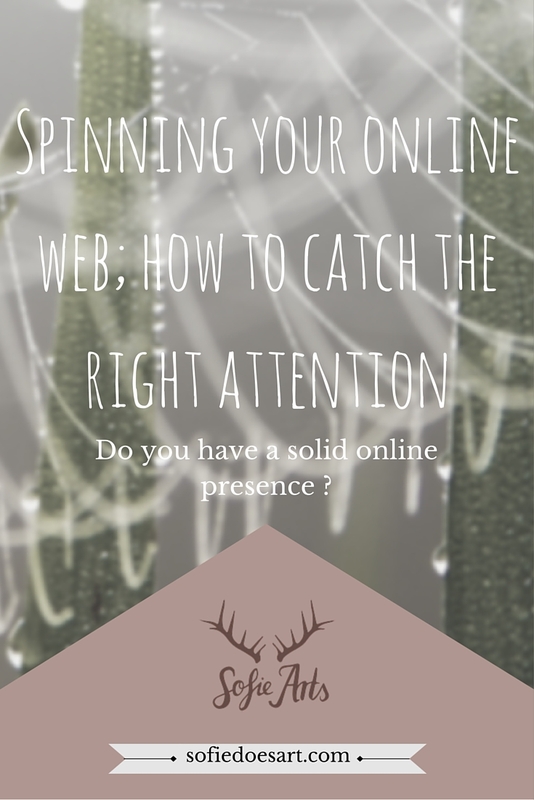 What are online webs you ask me? Well, basicly it is a made-up term I use to describe the online empires and internal constructions in those that these poeple have built that keep getting more and more people attached to them. How does an online web look? Cross connections; Of course after all that you will need to have links between them and outwards to get people in. It is al about firstly being there where the people are, then you capture their attention and from there on you have to lead them further into the web. If you are on social media than you marketing strategy is how you are catching people’s attention. A link to your blog in your social media biography is the most simple way to get people to your main site via your pillars. Many people apply this without thinking. But you can also send them to other main pillars like your other social media accounts. One of the important rules of this theory is also to not spread your web to thin. If you are one every social media outlet but you are not using them all these parts are not useful in your web. You want to catch attention and that is mainly done by making sure people find you and then find more of you. If you social media outlet is dormant or you don’t use it that much the chances are people will click right past it. I have also seen people that have so many pages and are on so many platforms that the whole thing just gets confusing. I couldn’t imagine having to keep up with all those different platforms. You want your readers to know here they can find you regularly. Some ways to catch attention. Apart from your own content, there are many ways to catch attention. One of them being tagging people in your posts. For example, when you are sharing content on twitter. When I am sharing someone’s content I like to always include by @… Even if that means I need to do some extra research. But when I am sharing the content of people in the same niche as me these people now will get a notification. Of course, another important part of your web is the commenting where you get to leave your site URL on others their blogs. However, it is important to keep this serious as well. You don’t want to go around and comment; “great post” on 100+ blogs. Leaving comments is not only ways to get your URL out there but also to catch the attention of bloggers! Want to know more about links and more importantly which links will actually hurt your website and therefore should not be in your web? 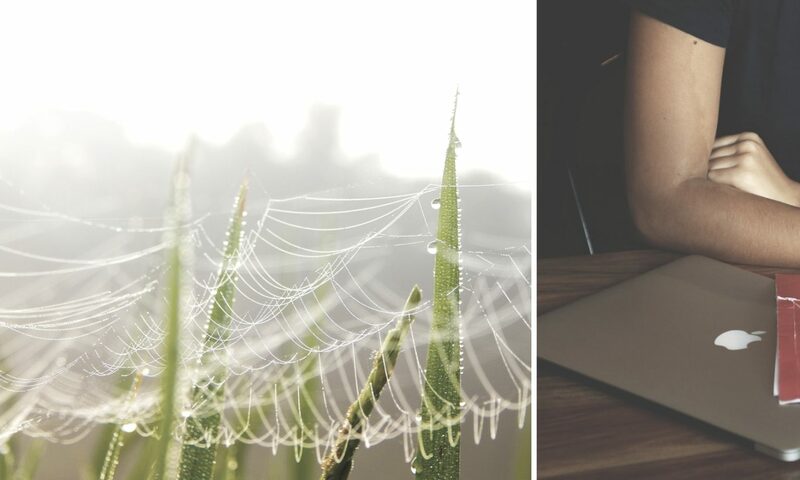 Kathleen over at The bloggers lifestyle has written an in-depth post on links and how to use them. Just like in a web you want the center to be the densest part. When people are on your site you want them to stay there for a while or you might even want them to go through a specific action. Buying your ebook,course or signing up for your email list. This means that withing you site you must have links that work and lead people to those pages. In google analytics, you can see how people come onto your site and where they go from there. 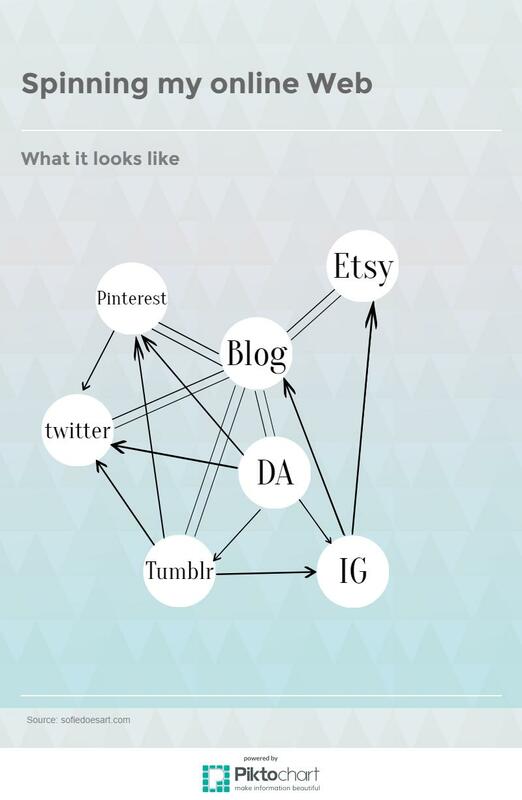 This might give you some insights on what links you want where to keep you readers attention. The amount people that look at only one page on your site before leaving is referred to as a bounce rate. A low bounce rate is better for your blog and when working with brands. Sarah from xosarah.com wrote a great post; ways to lower your bounce rates. How is your online web doing? One of my favourite ways to get a little overview on my online web is by just drawing it out. This is a great way to see which pages might need some extra work or if there are social media outlets that you could use even better. You can tweet you social media pages, you can pin your Instagram etc. Maybe this will help other people find you! As you can see I like to use my DeviantArt as a big part of my web because that is where the artist are that I want to help! Doing a little self-review can give you a great insight one where you the web might need some more work. Where there are holes and or parts missing. But also, what your strong points are where you are catching the attention just fine. Have you ever thought about it like this? Do you feel like your online web is doing alright? I enjoyed my visit here on your website! I would like to have a website like yours’, to continue my weight loss blog on. The name of my blog is Push Dump Fat Button Blog. You have lots of beneficial information here.